Have you noticed that your door seems to be the focal point of noise intrusion into your room? It should be no surprise, because most interior doors have air gaps around the frame, and at the bottom near the floor, creating clear paths for noise to travel into your room. Who would want to soundproof a door? Maybe you like your personal quiet time, but live with less than monk-like roommates in an apartment. Maybe you have a pack of teenagers living at home and you want to regain some privacy in your master suite. Or, maybe you rent out a downstairs rental suite with a shared door and want to maintain privacy for both parties. Whatever your situation, we’ll show you how to soundproof a door below. It’s time you take some steps to create a soundproof door, and regain control of your space. Can you Soundproof French Doors? Can you Soundproof a Glass Door, or Sliding Glass Doors? Soundproofing an existing interior door, like a bedroom, or apartment door, is a non destructive process, and can be easily applied to any door when living in a place that you don’t own. 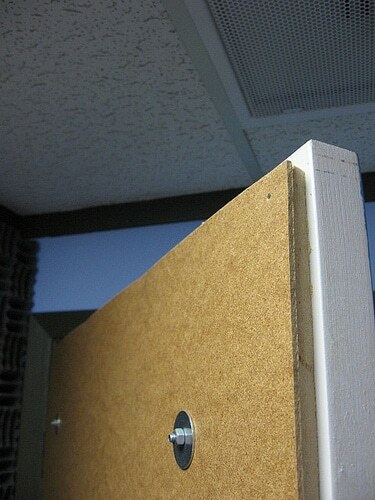 These 3 simple steps work well for soundproofing bedroom doors, apartments, and even for soundproofing studio doors. First, check for any existing weatherstripping that may be attached to the door frame. If there is weatherstripping, check how snug the seal is. If you are not getting a good compression seal, then you will want to remove the old stripping foam and replace it with some quality high density foam tape. Peel the adhesive liner off the tape and apply it firmly along the entire vertical and horizontal surfaces of the door frame. The door should compress against the foam, making a good acoustic door seal that is difficult for noise to pass through. Next, look at the bottom of your door. If there a gap leading directly into the next room, then you should buy a soundproof door sweep kit, which will block sound from entering underneath your door. The door sweep has a high density foam seal that will press firmly against the floor. Finally, check what kind of door you are dealing with. Is a hollow core door, solid wood, or metal? A hollow core door is going to transmit more sound than a solid wood or metal door will. In this case you will want to add some mass to the inside surface of the door to absorb and dampen sound that still is getting through. There are a number of simple products you can hang on the back of your door like plain black foam padding. I have found that a better performing, and better looking option is to attach acoustic tiles to the door with some Ape Tape. If you are soundproofing an apartment door that you don’t want to risk damaging with tape, I would try using the 3M Commander removable tape strips. There is little in the way of insulation and soundproofing in most garage door designs, it’s just a series of thin sheet metal parts attached to a pivoting frame. Soundproofing a garage door follows much of the same steps we took in when soundproofing an interior door, only with more robust weatherproof materials. First, you need to attach a thick weatherstripping to the bottom of the door. Just like on a regular door, not having a tight seal at the bottom leaves an open air path for noise to enter or exit. Next, you need to close up the sides. When the garage door is down, if you can see the outside light through the sides, then you will definitely have sound leakage. You want to install weatherstripping along these edges to seal up against the door when its in the down position. Finally, you can insulate the individual panels with a garage door soundproofing kit. These kits have insulation batts that fit into the frame around each panel. It has been shown that insulating your garage door can reduce sound by up to 20%. If you are soundproofing a studio, you can apply acoustic door seals around the perimeter of your studio door, much like we outlined above for interior home doors. These door sound seals are made of dense closed cell foam that makes a positive seal with only a little compression required. You may need to add mass to one side of the door for added sound absorption. French doors can be soundproofed to an extent. There are more gaps for noise to transmit through in this type of door, so it’s critical you buy two good door sweep kits and some good closed cell sound absorbent tape to put along the outer edges of the door. On a french door you will want to have a good seal in the middle, where the two doors meet when closed. Yes, sliding glass doors can be soundproofed, and it’s actually very similar to how windows are treated for noise mitigation. You can purchase add on door frame that bolt on over your existing glass door to add a layer of insulating air between the door and the noise. The frames can be attached on the inside or outside, depending on your type of door or preference. I hope by now you see how easy it can be to soundproof the doors in your home or apartment. With just a little bit of work and some experimentation, you can successfully keep noise within your room, or block it from intruding on the peace and quiet you deserve. I’m looking to soundproof a french door-sized hole between two rooms. E.g., I’m assuming it’ll be sealed and am happy to take down the existing French doors. Not sure where to look for creating a “permanent” (I rent) soundproof wall between two rooms.